Maybe that person 94 years old and overjoyed to be breathing in and out each day. They say, “I’m still here!” with joy and a smile and you, too, are happy they’re still here. Maybe another person sighs before they speak. 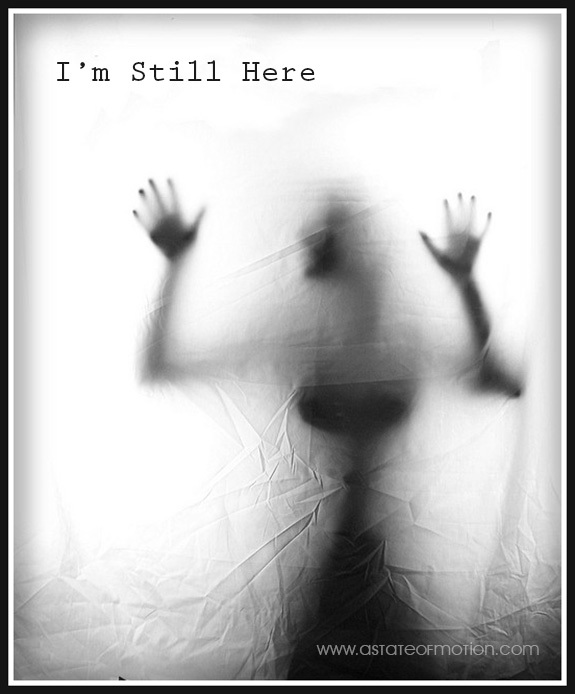 “I’m still here,” they lament. They’re in the same dead-end job as five years ago, they’re still in an ill-fitting relationship they can’t seem to leave, or they are stuck in a dangerous neighborhood. You feel the weight of that stasis. I’m two and a half years past my divorce’s finalization and I not only survived but my level of contentment is higher than I knew it could be back when my marriage suffocated me. My children are excelling in school and feel good in the new district. I’m living in a single family home and my new job is going well – I expect I’ll be able to prove my worth enough to be promoted in the next 6-12 months. I’m excited about the possibilities with my new company. My ex husband and I maintain an amicable relationship that I know helps the kids feel more at ease. I’m one and a half years into a relationship with my boyfriend. I haven’t found a rhythm for fitting regular fitness into my life and so my old skinny clothes still don’t fit. My old friend Hildy and I still haven’t made up but I did reach out to her recently and it seems we have a chance to reconnect one day. Some days I lapse into old patterns of anxiety and fears and let them overtake my more rational sense. My boyfriend hasn’t created or enforced better boundaries with his ex and we’re no closer to knowing if we will be together for the long term than we were at this time last year. I feel caught between thinking I can’t take any more of the stress associated with his chaotic ex-related life and thinking maybe if I hold out just one more month things will improve. My little, imperfect house is more put-together each weekend. But then each weekend I yearn to buy a home of my own. Maybe with Greg, though lately if feels more likely that I’ll be doing it alone. My relationship with one of my brothers is better than ever, but my sister unfriended me on Facebook for the sixth time and I’m quite over her hurting me. My creativity isn’t finding much outlet these days but, hey, my Instagram account has grown more popular. I still listen to the radio on the way to work but it’s less pop music and more NPR. I haven’t quit caffeine but it’s more coffee and less diet soda. I still look younger than I am, allegedly, but now I look like I’m actually in my 30s and not my 20s. I still have my nose pierced but there will come a point in my career path where I will probably have to remove the stud to move up further in the food chain. I haven’t written anything in ages but my reading mojo is slowly returning. I’m reading your blogs, my friends, though my commenting is weak, I know. I tell you what, this working full time while single parenting is no joke. I wake up at 5:40 a.m. and am not home until 5:30 p.m., at which point I make dinner, clean up after dinner, help with homework and sign folders, get the kids in bed and then collapse at 9:00 p.m. despite having ten thousand things I should do before I fall asleep. Days I don’t have the kids I see Greg and we deal with his work/life/children stress and dance around the subject of our future. Though I don’t look back wistfully on my days as a stay-at-home mom, either. That life was equally as hard and rewarding, just in different ways. I think the next six months will be big for me. Perhaps in six months I won’t feel like I’m simply still here. Hopefully I’ll feel like I have a clearer path when it comes to work, my living situation and my relationship. Photo by Kathryn used under Creative Commons. I liked reading about what you’ve been up to. Seems mostly good things (except the boyfriend’s chaotic ex-wife stuff and the sister unfriending. Yikes.). I think you should block your sister on FB. Sometimes it does not work to be “friends” with family online.